Madhya Pradesh is also referred to as wildlife state with numerous wildlife sanctuaries and reserves offering a chance to witness wild exotic animals in their natural habitat. But have you ever wondered, how did it all happen? In a time where animals are going extinct, Madhya Pradesh has played a pivotal part in India’s wildlife conservation programs. From preserving tiger population to boosting the declining leopard counts to being the state with most Gharial population, Madhya Pradesh has come a long way in protecting the natural order and natural habitat for animals. Madhya Pradesh has implemented many important conservation policies and ensured a crackdown on poaching, combination of which has led to Madhya Pradesh being home to many endangered animals. However, things haven’t always worked out as per plan and the state has also seen numerous incidents of failing conservation policies. This article would analyse all the achievements and failures of conservation policies of Madhya Pradesh to present a complete picture. The state with third highest tiger population in India at 308 during a Tiger census in the year 2014, Madhya Pradesh has played a vital role in the tiger conservation in India. With its 6 tiger reserves, spread throughout the state, MP is also referred to as the tiger state because of its high density of tigers in India. A state where you can easily spot tigers roaming in their natural habitat, wildlife safaris have seen an increase in the footfall of visitors visiting tiger reserves in Madhya Pradesh. Data is of tiger census 2014. The actual numbers may vary as per recent census. After the initiation of Project Tiger in the year 1973 by Indira Gandhi led Government of India, 9 tiger reserves were created in India. 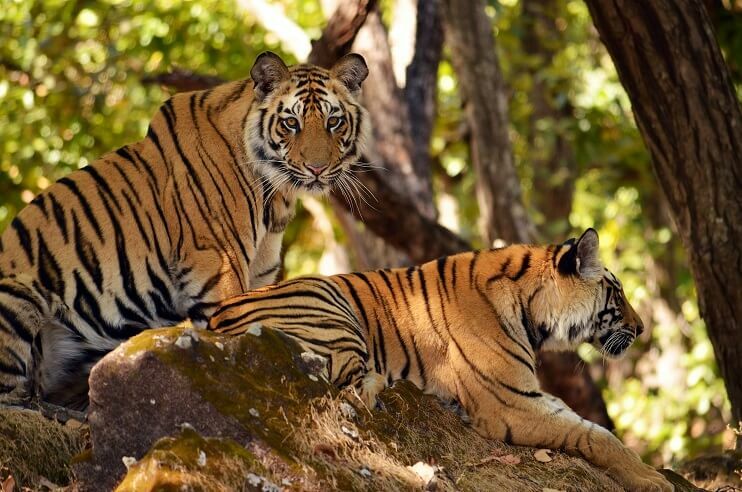 In Madhya Pradesh, Kanha National Park was the first park to be declared as Tiger Reserve. Since then, 5 more tiger reserves have been added to the total tally of 6. 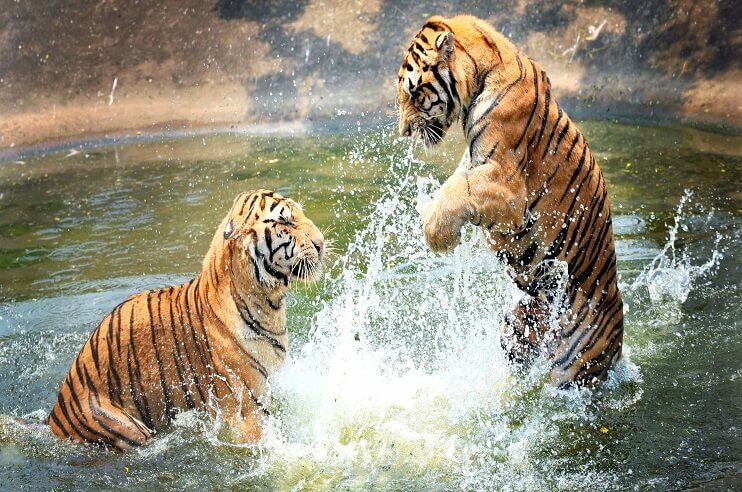 Madhya Pradesh is an epicentre for tiger safaris in India, with the state being the third highest tiger populous state in India. Home to white tigers, Mukundpur has added another crown in the jewel of Madhya Pradesh. Panna National Park was also awarded the award of “most well-maintained national park in India”. MP has the third highest tiger population in India. The state is also home to the only white tiger sanctuary. Also known as the tiger state, spotting a tiger is easiest in the tiger reserves of MP. The state has seen as rise in the total tiger population in its tiger reserves, result of extensive tiger conservation projects throughout the state. 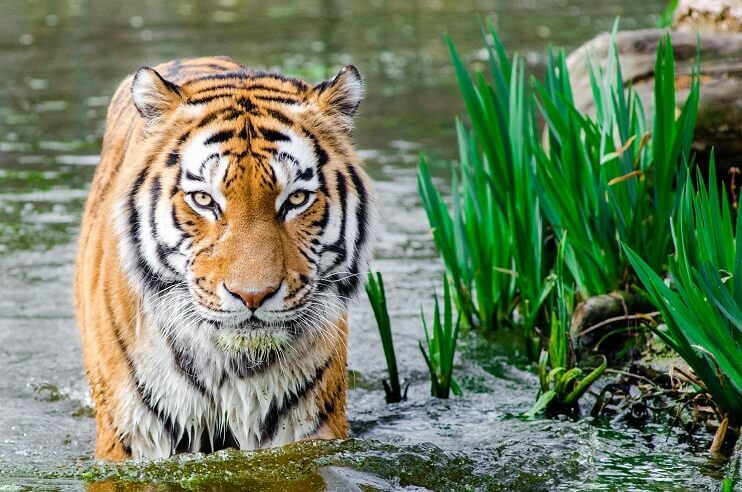 Panna National Park which housed around 40 Tigers had lost the entirety of the tiger population by the year 2012. The major reason attributed to the loss was the excessive poaching in collusion with the staff. There was no official enquiry or probe in the matter. However, the reserve was repopulated again by transferring tigers from other reserves. The relocation of the Baiga tribe, that inhabited the land, had raised several concerns in its early years. The tribe was relocated to the barren lands which has resulted in severe malnourishment and alcoholism in the Baiga Tribe. The last tribe was illegally relocated in the year 2010 without proper compensation. For the year 2018, MP witnessed most tiger deaths in India with a total tally of 23. Credits to various conservation drives and efforts, Leopard population in Madhya Pradesh has witnessed an increase. The recent survey has concluded that the leopard population has grown more than the tiger population in the state. Although, it’s notable that without any proper conservation programs in the state, the leopard population has shown rapid growth. The striped big cats have always attracted the attraction of wildlife enthusiasts; no proper conservation efforts were placed. Yet, Madhya Pradesh forest reserves have always been a safe haven for the Leopards. 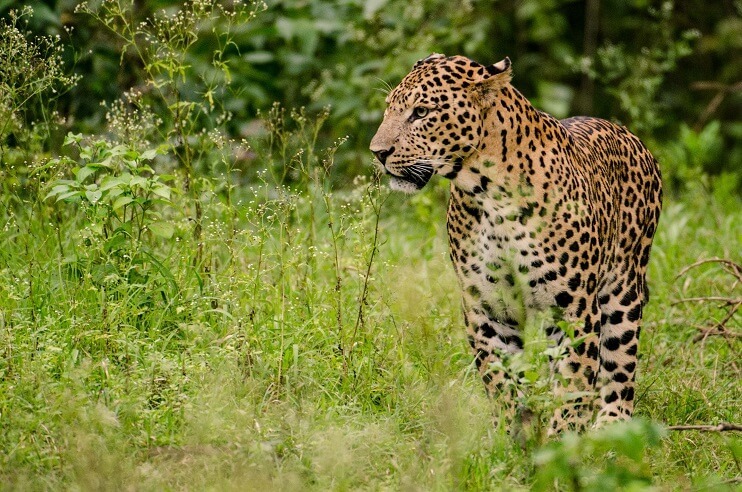 A recent survey conducted in 2018, alongside tiger census, revealed the increase of Leopard population. Indian Leopard is a leopard subspecies native to the Indian subcontinent. The species was declared as critically endangered in the country by IUCN Red List because of declining population, resulting from loss of habitat and human-animal conflicts. However, the success hasn’t come easy. Cases of poaching have been increasing in and around Madhya Pradesh. With conviction rate of 5% in the state, poaching was going rampant. In the year 2018, Madhya Pradesh witnessed 37 leopard deaths. Many reasons were attributed for the deaths of leopard in the state, majorly focusing on linear infrastructure and increasing human-animal conflicts. However, the picture hasn’t always been this rosy. In the year 2014, a published report placed the leopard deaths to around 60 in three years. The report estimated that if no action plan is implemented, the state might soon lose the entirety of its Leopard population. The constant efforts of conservationists and help from the government ensured that the state government ensures the presence of healthy population of Leopards in MP. The Leopard population in the state surpassed the tiger population in the state. It’s noteworthy that despite lacking proper Leopard conservation policies, the state has managed to increase the Leopard population from 1500 in 2015 to more than 2,000 in 2018. Cases of poaching has reduced in MP because of heavy patrolling and constant surveillance around the wildlife sanctuaries in the state. Despite the increase in the population, there has been no proper road map for conservation of Leopards in the state. Although the population has increased, the cases of Leopard deaths in the state has also seen an increase. For the year 2018, the state witnessed deaths of 37 Leopards, 4th highest in the country. Linear infrastructure has always been a recurring topic of discussion when it comes to wildlife preservation in India. Linear infrastructure has led to many Leopard deaths in the state, mainly road accidents. The law for poaching of Leopards are considered lenient, with just 5% conviction rate, the poaching is still one of the biggest challenge for Leopard conservation. A bird which was once taken into consideration for being the national bird of India, today stands on the brink of extinction. Great Indian Bustard or Indian Bustard, a species native to the Indian subcontinent, was known for its ostrich-like appearance. A bird which had a total population around 1200-1500, today the population is reduced to 150 odd. The bird species were found in the states of Maharashtra, Gujarat, Andhra Pradesh, Madhya Pradesh and Rajasthan. Madhya Pradesh was home to the majestic bird, however, rampant poaching and shrinking natural habitat led to the total extinction of GIB population in the state. The bird species was declared critically endangered in the year 2011, after the loss of 90% of the total bird population. Madhya Pradesh has two wildlife sanctuary which were famous for their Great Indian Bustard population. 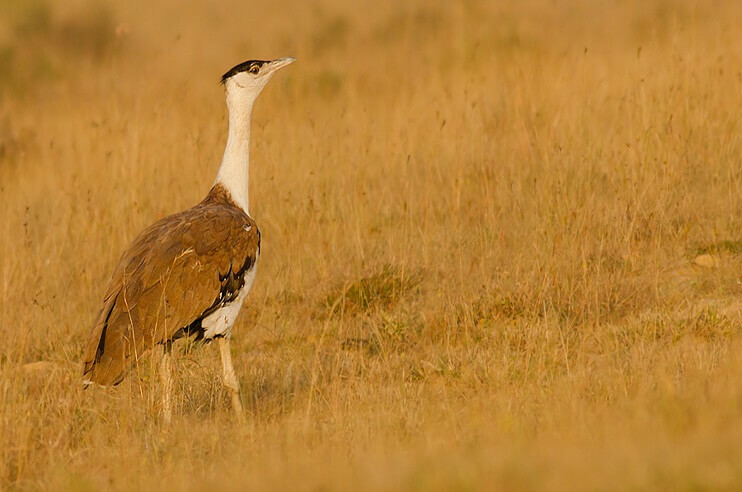 Karera Wildlife Sanctuary and Ghatigaon Wildlife Sanctuary were the two designated sanctuaries for the endangered Great Indian Bustard. However, the parks are about to be decommissioned because of no GIB sighting in over a decade. The government of MP tried to repopulate the state with two GIB, however, there was no follow up on the same. Despite the species being declared critically endangered in the year 2011, there was no proper safeguards to prevent the remaining GIB population. The efforts to repopulate the GIB in bird sanctuaries in Madhya Pradesh never actually saw any real progress. A bird species which used to rely on human population for its survival in India almost came back from the gates of extinction. Part of the natural animal disposal system, the first decline in the population was noted in the 1990s by Vibhu Prakash. The rapid decline caught the attention of many international scholars. While many attributed pesticide poisoning, bacteria and industrial pollutants as the reasons for the population decline, Dr Lindsay Oaks’ report proved helpful in tackling the crisis. In the report, it stated that Diclofenac is the major cause for the decline of the population. Diclofenac is an anti-inflammatory drug given to livestock and is used to treat symptoms of fever. The drug was fatal to the vulture and if consumed through the carcass of livestock, could prove fatal to Vultures. The newly available information helped in presenting the case for banning the drug for veterinary use. The population of the big bird was estimated around 40 million in 1990 to a few thousand in the early 2010s. However, during the recent survey in the year 2015 and now in the year 2019, the results have shown a positive result. Although the results are far from restoring the actual vulture population in the state, the rise has come as an inspiration for activists. The population of vulture which was reduced to 98% of its original tally has seen an increase in population in Madhya Pradesh. The population is estimated to be more than 2000 in the state. 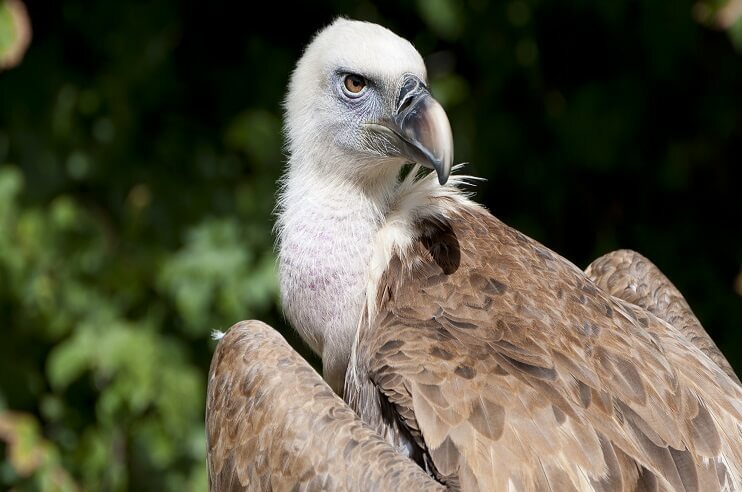 The breeding centres in the state have proven to be vital to restoring the population of vultures in the state. Once a thriving species found in the rivers across India, Gharial saw itself in shallow waters with depleting population. The fish-eating reptile faced serious survival challenged with the construction of dams, depleting fish population and getting trapped in fishing nets. Once found in abundance, the population was reduced to odd 300-400 by the year 1979. It was in the year 1979 when the Gharial conservation mission began in the Chambal region. A species that was widespread throughout the Ganga river to Indus river in Pakistan to Irrawaddy river in Myanmar, by the year 1976 the population was reduced to 2% of its historic tally. The extensive conservation efforts and proper safeguards ensured that the imminent threat of extinction is averted. Then came the challenge of repopulating. Madhya Pradesh has played a major role in repopulating the species throughout the Northern, Central and Western India. 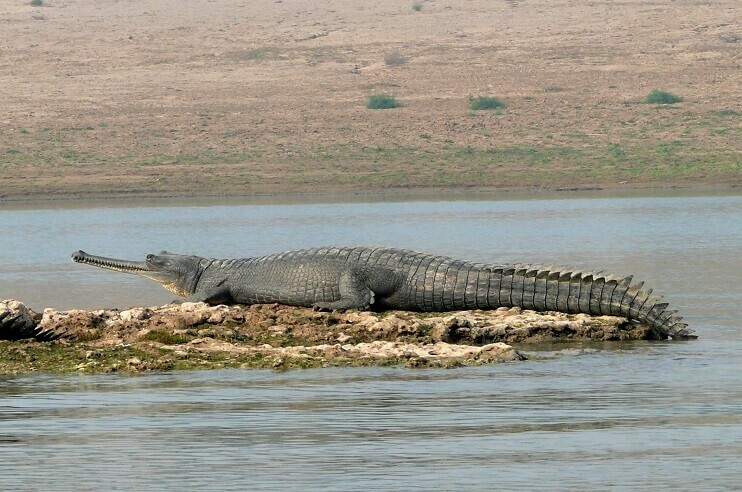 Today the reptile population has increased to more than 1680 Gharials in the Chambal Sanctuary area alone. An increase of 426 Gharials was reported for the year 2017-2018, highest for any year. However, the achievement wasn’t easy to come by as the authorities witnessed a sudden death of 100 Gharials in the year 2008, which put the conservation efforts under scrutiny. But the record increase in the population is a big boost to conservationists who have ensured such a result. Son Gharial Sanctuary is another destination to witness the majestic creature. Son Gharial Sanctuary along with Chambal Sanctuary alone has ensured a healthy Gharial population, some of which are being transferred to other regions to ensure even distribution. After the inception of Gharial conservation mission in the year 1979, the state of Madhya Pradesh has seen an increase in the Gharial population across its two major Gharial Sanctuary- Son Gharial Sanctuary and Chambal Gharial Sanctuary. The population of Gharial in Chambal Gharial Sanctuary has reached to more than 1,680, marking a record increase of 426 over the previous year’s tally of 1,255. Both of these Gharial Sanctuary have also attracted numerous new species of migratory birds. Son Gharial Sanctuary witnessed 24 avifaunal species. This has led authorities to believe that these sanctuaries will soon become an Important Bird Area(IBA). Banning the illegal sand mining along the Son river and Chambal river is also attributed to the increase of Gharial population in the state. Earlier, many of the hatched eggs used to be destroyed because of the illegal sand mining in the area. Barasingha, a.k.a Swamp Deer is a deer species which is majorly found in the central and northern India. Native to the Indian subcontinent, the deer is recognized by its antlers, which carry more than 3 tines. The meaning of the name Barasingha implies the presence of 12 tines on the antlers, some are even recorded with 20 tines. A majestic animal which was historically found in the base of Himalayas, from Assam to west of Jumna river, in few places of Indo-Gangetic plain and locally between the areas of Ganga and Godavari. A critically endangered species, Barasingha flocked the grasslands of Northern India witnessed a battle of survival with rampant poaching and hunting. Another challenge it faced was the decreasing natural habitat. In 1960, the total population of Barasingha was estimated around 1600, after facing a drop from 2150. The population saw a continuous decline because of no conservation policy. However, Madhya Pradesh has come as a beacon of hope with Kanha National Park being home to more than 450 Barasingha. Kanha National Park is a safe haven for the species, with it being the only national park in India where Barasingha can be spotted in their natural habitat. The road hasn’t been easy to travel as Kanha National Park started the conservation program with just 60 Barasingha in the 1970s. From there, the park has shown staggering results with more than 450 individuals in Kanha National Park. The park has also been an active contributor in populating other wildlife sanctuaries in the state and other parts of the country. Barasingha is also the state animal and Kanha National Park is India’s only park to have an official mascot, Bhoorsingh -- The Barasingha. 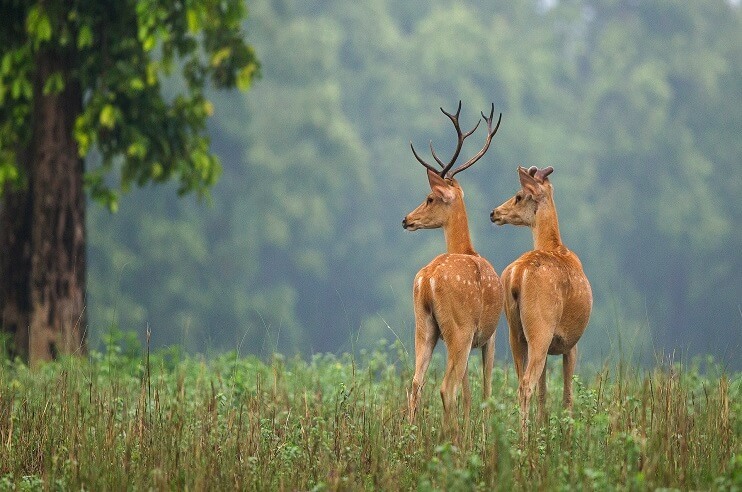 Kanha National Park is home to more than 450 individual Barasingha, living in their natural habitat. Kanha National Park is the only national park in India where you can spot the majestic creature in its natural habitat. Other small pocket of Barasingha population in Van Vihar have also shown a stable increase in the population of the species. The state has been a hotspot for many wild species and the government has been extensively working to conserve many other species too. We would like to congratulate the state and conservationists for their contribution to these conservation programs.